Bridget Ennis was twenty one years old and Bridget Butterly nineteen years old when they were both imprisoned in Kilmainham Jail in Dublin. They had been convicted of the murder of a young lady, Miss Thompson who lived in the house that Bridget Butterly had been a servant in. They were sentenced to be publicly hanged. The Governor of Kilmainham, a Protestant, was worried about about the two young women. He asked the Sisters of Charity in Stoneybatter would they send someone to talk to the women who were angry and scared as they were due to be hanged in public in a few weeks time. This was the second convent to be set up by the Sisters of Charity. 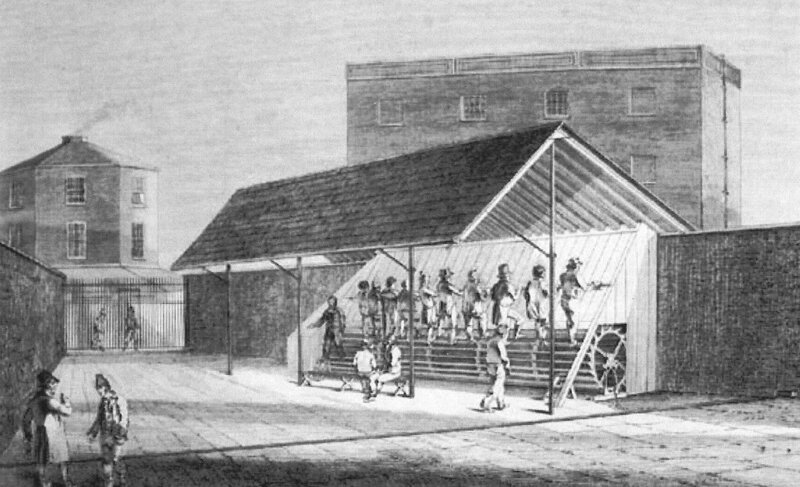 It had opened in 1819. It was April 1821 and the girls were to be hanged in May. Mother Aikenhead, the head and founder of the Order and Sister Catherine went to Kilmainham Jail to see what they could do. The two women did not want to talk to the nuns and were rude and aggressive. But they were still visited every day in their cells and eventually the girls softened to the nuns and began to speak to them. Mother Aikenhead and Sister Catherine made it clear that they were not there to judge them, and very soon the girls accepted their help. They talked for hours and prayed, preparing themselves for the execution. They explained the events leading up to the murder and the reason behind the robbery. 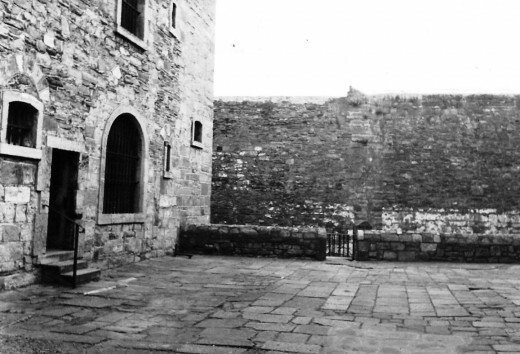 It was the morning of the execution at eight o’clock and both women, Bridget Ennis and Bridget Butterly made a confession. After spending so much time with the nuns praying and as the hangings grew closer they feared for their souls. Bridget Butterly gave her account of life in the Peck household. She was working as a servant in Dublin and was in Chapel Street when Captain Peck approached her. He made inappropriate advances towards her and she became frightened. She left the street but on returning the next day she was again confronted by the Captain. This time he persuaded her with offers of money and an easy life to come to his house as a ‘servant’. She became his lover and soon became pregnant. She had a miscarriage. It is not reported how long this relationship lasted. The Captain was married and other servants were living in the house. Bridget was eventually sacked by Captain Peck who gave the reason that he had heard she was making inappropriate remarks about members of his family in the house. She would have been unable to get a reference and therefore unable to get another job. She spoke to her friend Bridget Ennis. She suggested they rob the house and use the money to run away to England. So the plan was hatched. In a Newspaper published in 1821 by William Carse the statement of events during the murder in Dublin from Bridget Butterly was published. Ennis replied, ‘how shall they find us out, when we are gone to England?’ ‘Miss Thompson let me in, kindly received me and shook me by the hand. Ennis desired me to put the handkerchief about Miss Thompson’s neck or face. I immediately fastened it about her neck, and dragged her down the staircase leading to the kitchen. The young lady called upon Ennis and implored her to help her. Ennis cried out, ‘Biddy, don’t injure the young lady;’ I replied, I have no intention to hurt Miss Thompson—Ennis left the house with a trunk. ……..I pushed her down the stairs, until I got her into the kitchen. 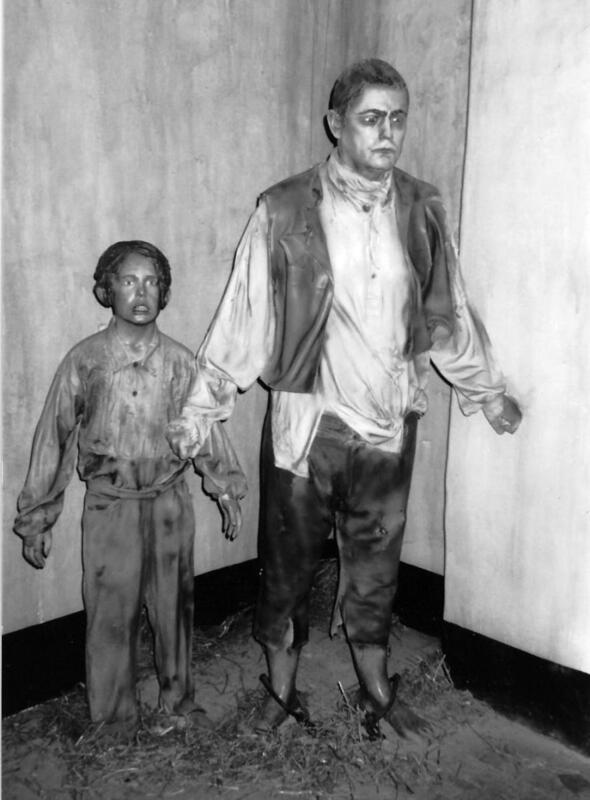 On 4th May 1821, Mother Aikenhead and Sister Catherine arrived at the prison at nine o’clock in the morning. They stayed with the two women in their cells until two o’clock in the afternoon when they were taken out of the cells. 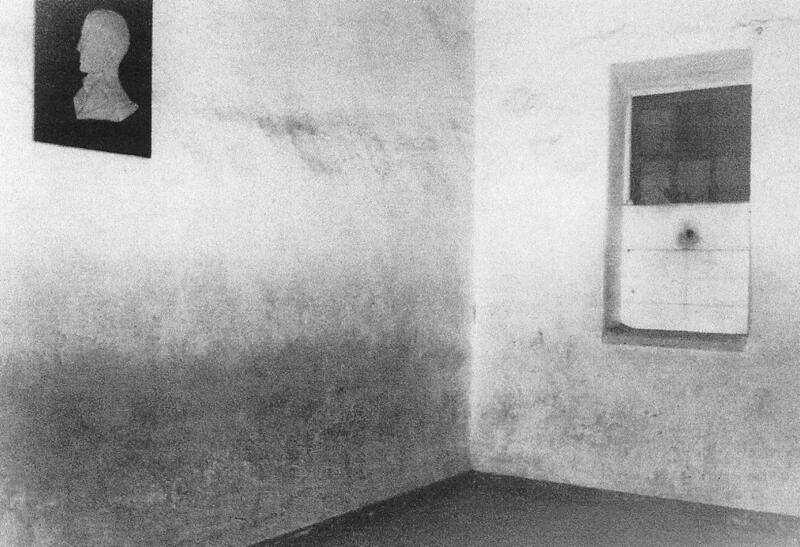 The two Bridget’s had asked the nuns not to come with them, but to pray for them in the prison chapel. 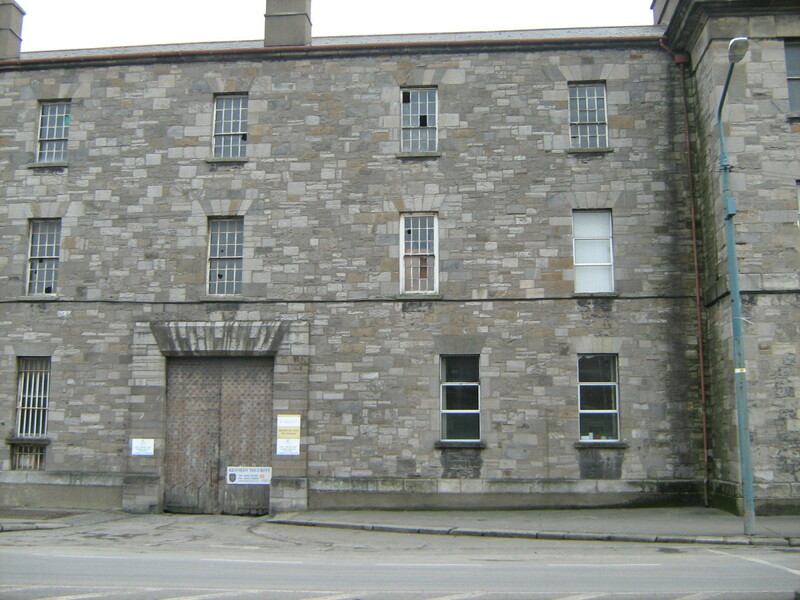 Outside Kilmainham Jail, directly above the front gate is where the ' Drop ' is located. 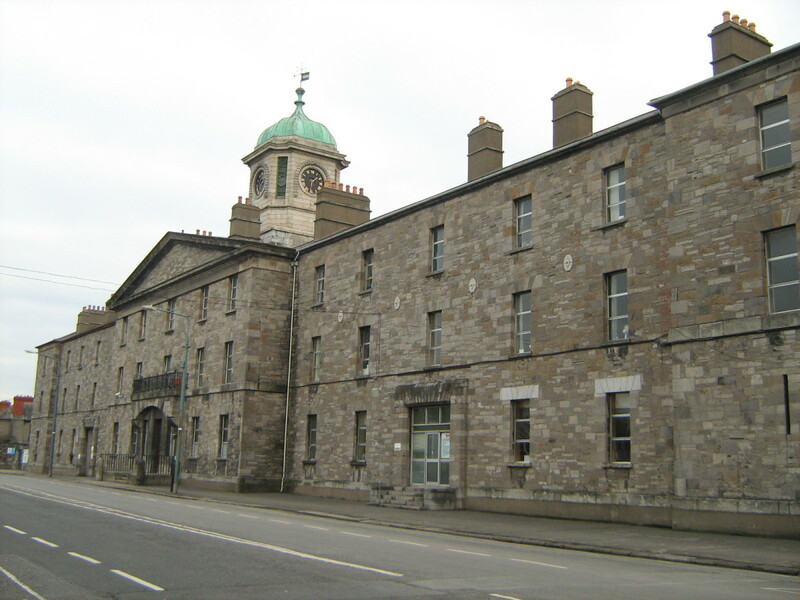 There were no railings around the jail at that time and over three thousand men, women and children came to the jail. Each girl was brought out and hanged, with the crowd cheering all about them. ……On Friday last, Bridget Butterly and Bridget Ennis were executed at Kilmainham Jail for the murder of a young lady by the name of Miss Thompson. …………When the awful preparations were completed, the drop fell, and Bridget Butterly died instantly. Bridget Ennis appeared to suffer much, her body heaving violently after her limbs had ceased to move. After hanging the usual time the bodies were taken down and sent to Surgeon’s Hall to be dissected….. 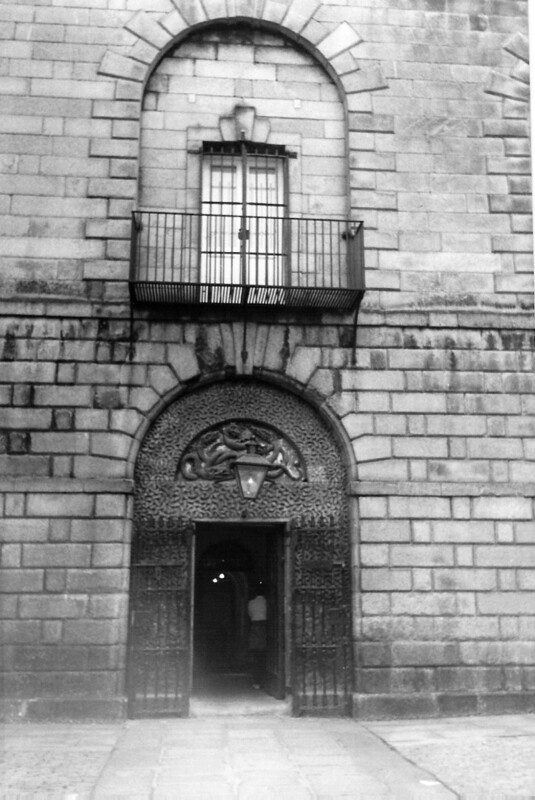 Mother Aikenhead and Sister Catherine remained at Kilmainham Jail in the chapel until four o’clock that afternoon praying for the women. 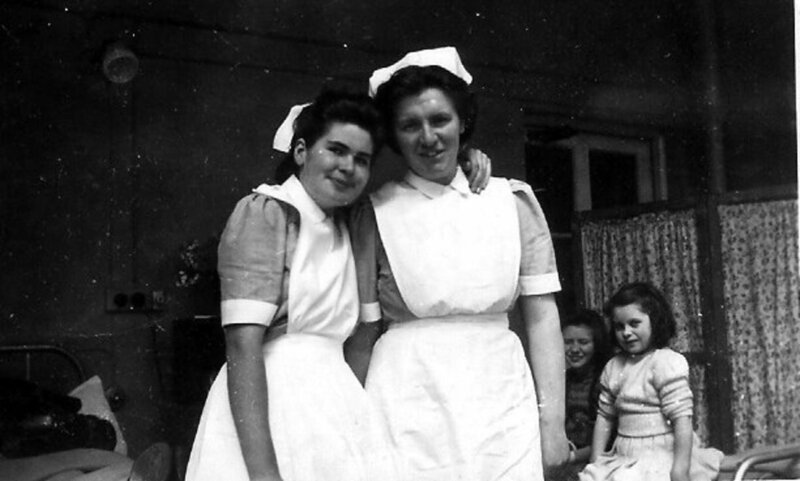 They were so affected by the incident that prison visits became another service that the Sisters of Charity at Stanhope Street began on a regular basis. They never judged the prisoners for their crimes, but gave comfort and spiritual healing where needed. …..Such is an account of this horrible transaction, and which strikes the mind with horror; these two young females, in an evil hour, and with the temptation of gain, murdered the unfortunate young lady, who a few minutes before, had shown them the greatest kindness, and who never dreaded the errand upon which they entered the house, should operate as a warning to all women, especially servants, to be beware of jealousy, and be clear of ill will to the persons whom they suspect to be their foes. 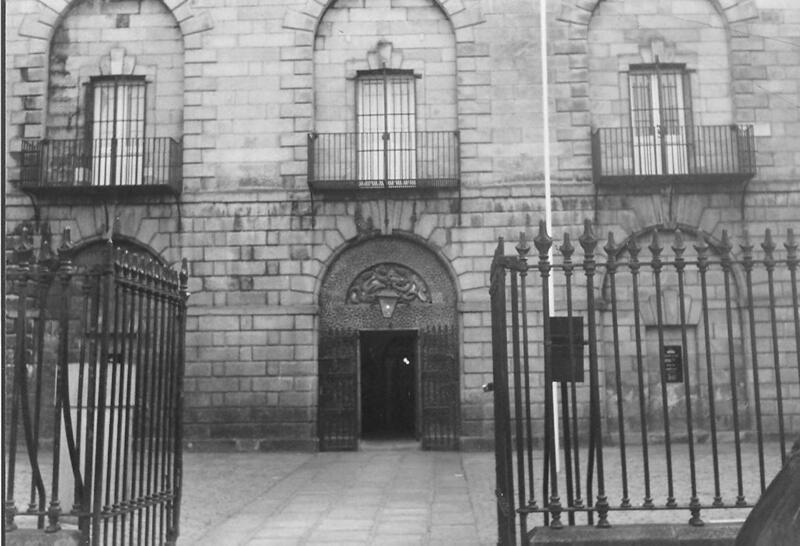 Bridget Butterly and Bridget Ennis were the last women to be hanged at Kilmainham Jail. The last public execution in Ireland took place in 1865. The Women were calm because of the visits of the nuns of the Sisters of Charity, Stanhope Street Stoneybatter. The last woman hanged in Ireland was Annie Walsh from Limerick in 1925. She was thirty one years old and had been found guilty of murdering her husband Ned with an axe. She was hanged in Mountjoy Prison in August 1925. Ireland was now a Free State and the Minister for Justice Kevin O’Higgins received letters from Annie Walsh pleading for a reprieve. She did not receive one. Annie Walsh was the only woman to be executed in Ireland by the Free State Government. 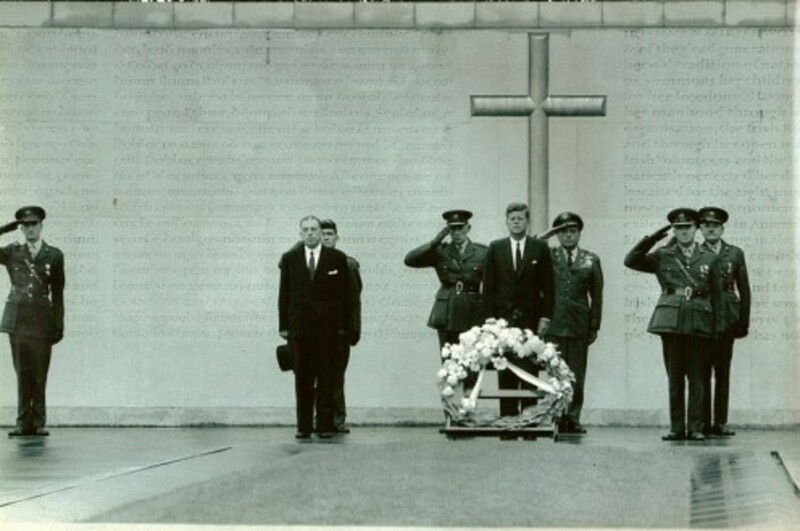 Michael Manning was twenty five years old and from Limerick. He was found guilty of the murder of Catherine Cooper a sixty five year old nurse. 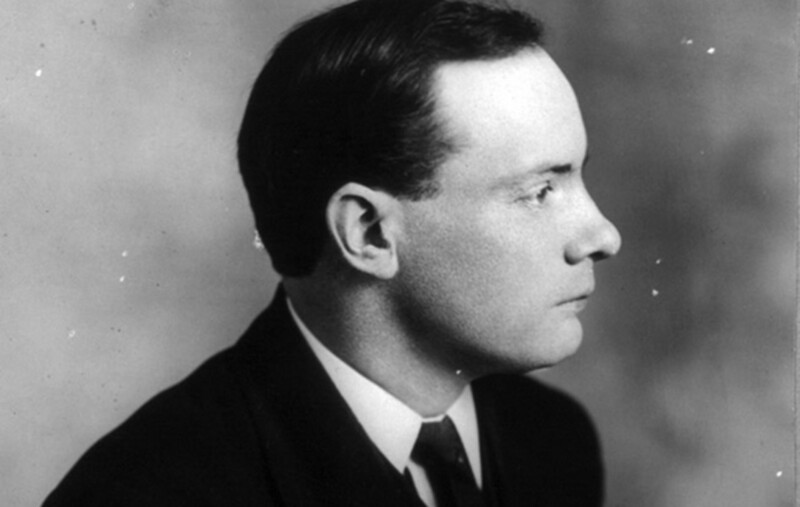 He was hanged on April 20th 1954 in Mountjoy Prison in Dublin and became the last person to be executed in Ireland. The death penalty was abolished by statute in Ireland in 1990 and following a constitutional referendum on 7th June 2001 it was erased from the Constitution of Ireland on 27th March 2002. Yes the death penalty was still in force for anyone found guilty of murdering a member of An Garda Síochána. Those two women were guilty of murder by their own admission but still they were terrified. The screaming crowds did not help either. Human beings can be very cruel. This is fascinating - I didn't realise the death penalty was only officially abolished so recently.Your hubs are a positive mine of information - brilliant. Thanks for reading hobo and MG Singh. Yes They were publicly hanged with thousands of people cheering all around them. It must have been terrifying and then one of the girls took ages to die because the hanging went wrong. Awful way Ireland meted out justice in those dark days. Its a wonderful hub, thoroughly enjoyed reading it. did the papers of the time give the addresses of the two girls or state where they were from? I was so absorbed with all these details that all I can say is that it is superb. The details were laid perfectly clear. Good job!